Troubleshooting car problems and knowing how to recognize the signs of common issues will mean that you can have your car repaired quickly and prevent the possibility of causing more serious damage. Also, being able to identify basic symptoms will make you feel more confident when talking to your mechanic and reduce the likelihood that repair shops will take advantage of your lack of knowledge. You don’t necessarily need to know the difference between piston rings and EGR valves, but a little knowledge can go a long way, especially when it comes to your car repair budget. For example, many shops will claim that you must replace your vehicle’s air filter, and if you do not know the signs of a clogged filter, you could end up paying for something that you don’t need. An appointment to replace brake pads can turn into a huge bill for new rotors and discs. Or, you may be talked into replacing a condenser when the real problem is simply a leaking air conditioning hose. You can’t expect to recognize and diagnose all car problems yourself. Mechanics are highly trained and experienced in working with a vehicle’s complex systems and high-tech features. So, you will often need to depend on their expertise. But, being able to do some basic troubleshooting can save you a lot of time and money, whether you take your car to a repair shop or fix the problem right in your own driveway or garage. Screeching or scraping sound when brakes are applied. This is the most common symptom of brake wear and is an audible sign that it is time to replace the brake pads. If you hear this sound, do NOT delay taking your vehicle into the shop. On newer cars, a built-in indicator is designed to let you know that the brake pads are worn. Ignoring these signs can cause the rotors to become scratched or scored, resulting in a much more expensive repair. Reduced responsiveness. If the brakes feel weak or spongy, if you have to push the pedal too far down to engage the brakes, or if stopping distance increases, you should have your system checked for possible problems. These issues could indicate a leak in the braking system, low or contaminated brake fluid, worn pads, damaged pads or trouble with the master cylinder. Vibration or pulsation when brakes are applied. This could vary from a mild shaking or “wiggling” of the steering wheel to a stronger pulsing similar to what you would feel if the ABS were engaged. Most often, this is caused by a warped rotor, although in some cases, it may be related to alignment or suspension problems. The car pulls or grabs when the brakes are applied. Brakes should engage smoothly and steadily. If you notice that they suddenly “grab” or that the car pulls to one side when braking, there could be uneven brake pad wear, a seized/sticking caliper or slide pin. Brake drag. If the brakes do not release immediately when you take your foot off the pedal, then you could be dealing with a bad wheel cylinder. It is important to have this checked by a mechanic right away, as brake drag can cause overheating which will lead to further damage. Misfiring or surging. You may notice a jerking or lurching that comes with a change in engine speed, or the feeling that your car is “speeding up” even when you are driving at a steady speed. The engine may also “miss” or shutter and shake, especially at low idle, and you may hear a spitting sound from the exhaust. 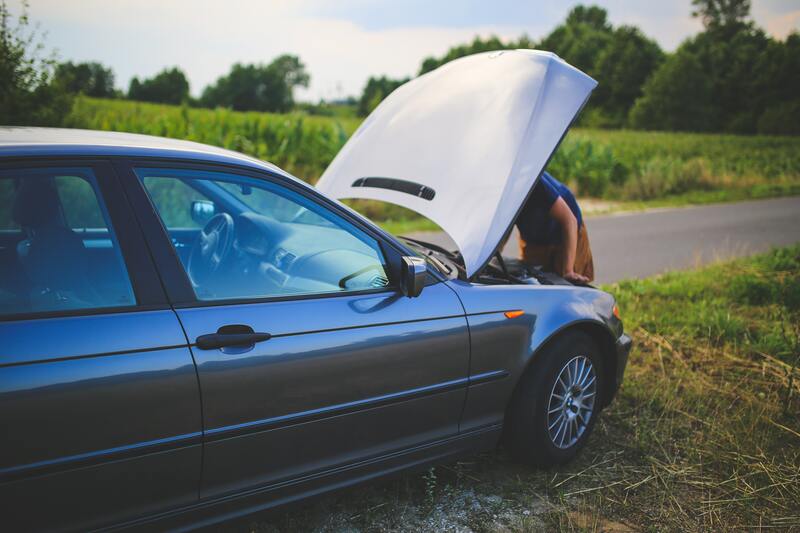 These issues can be caused by a number of car problems including a clogged fuel filter, dirty fuel injectors, worn spark plugs, malfunctioning O2 sensor, incorrect idle speed, or the EGR valve. It can also mean that the distributor cap needs to be replaced or the carburetor needs repairs, or it may be related to a problem with your vehicle’s computer system. Engine hesitation. There may be a delay or hesitancy when you push the gas pedal, and will most likely be more obvious when starting from a complete stop, although you may also notice it at higher speeds. The engine may even stall. The most common causes include a dirty air filter, worn plugs, and wires, ignition wiring problems, or water in the gasoline. Pings, pop, or rattles. The engine may be making knocking, tapping, or pinging sounds that increase during acceleration. This can occur for several reasons including ignition timing problems, compression issues, or low quality/ low octane gasoline. Oil consumption. You may need to top-up your oil level between oil changes, but if you are using an excessive amount, it would be wise to have your vehicle checked by a mechanic. Oil consumption can indicate worn piston rings or valve seals, or problems with the head gasket. Unusual odors. If you notice smells inside the car, this can be a sign of a coolant or oil leak or damaged belts and hoses. Smoke from the tailpipe. If the exhaust has a slight blue tinge, it can be an indication that oil is mixing with the fuel. If there is an excessive amount of white smoke, this can mean that condensation or coolant is getting into the fuel. This is most often caused by head gasket failure. Check Engine light. This is usually the first sign that something is wrong with your engine. If you notice this light, you should have a mechanic check your vehicle with a scan tool to help determine the cause. You can also purchase your own scan tool for about $100. Screaming or squealing when the engine is cold. This is usually caused by a faulty alternator. Grinding noise. This may also indicate a problem with the alternator, although it can be connected to a worn out or broken water pump. Vibration. The steering wheel may shake when accelerating or when driving steady, although you may notice an increase in vibration at certain speeds. This usually indicates out of balance tires, loose wheel bearings, incorrect tire pressure, uneven tire wear, or a damaged tire. Clunking or bottoming when driving over bumps. This is usually a sign of worn or broken shocks or struts, or damaged ball joints. Loose steering. The car will wander from side to side, there may be excessive play in the steering, or you may have to turn the steering wheel unusually far to get your vehicle to respond. This can be caused by a number of car problems including loose wheel bearings, worn steering linkage, worn/broken tie rod ends, low power steering fluid, or suspension issues. Hard steering. The vehicle may be difficult to steer, especially when first started. This can be caused by low power steering fluid, worn/damaged steering rack mounts, low or uneven tire pressure, incorrect alignment, or problems with the power steering pump. Shimmy or sway. The front end of the car will move from side to side, even when you are making an effort to keep the wheel straight. This symptom usually means incorrect tire pressure, uneven tire wear, improper alignment, loose wheel bearings, sticking brake caliper, or worn steering components. Screeching or squealing sound. You may notice a screeching or humming sound when you turn the wheel far to the left or right, especially when parking or going around sharp turns and corners. This is usually a sign of a worn or loose steering belt or low power steering fluid. Leaking fluid. Transmission fluid is usually bright red or pink and transparent. If you notice any puddles under your car, this is a good sign that you have a leak somewhere in the system. You should also check your levels regularly to detect any possible internal leaks. Shaking. Shaking or reduced power can be caused by low fluid or trouble with the torque converter. Slipping or hesitations. If the transmission is slow to engage or seems to slip, this is usually caused by low or dirty fluid or a plugged filter. Burning smell. A bad torque converter can cause overheating and create a burning smell. You may also notice an odor if there are transmission leaks that drip onto the exhaust system. Check Engine light. A transmission fault code will cause your check engine light to come on. Unfortunately, this is connected to the vehicle’s computer system and you will have to use a diagnostic tool to identify the problem. Preventative maintenance will reduce the risk of major breakdowns, but some car repairs are inevitable. So, it is important that you recognize common symptoms for troubleshooting car problems and then budget in a reasonable amount for fixing and maintaining your vehicle. However, due to the complexity of high-tech systems in late model vehicles, perhaps the best thing you can add to your transportation budget is extended mechanical breakdown protection. autopom!‘s exclusionary vehicle protection plans cover virtually all of your vehicle’s mechanical and electrical components. Let us know if we can be of assistance. Request a free, no-hassle quote today!